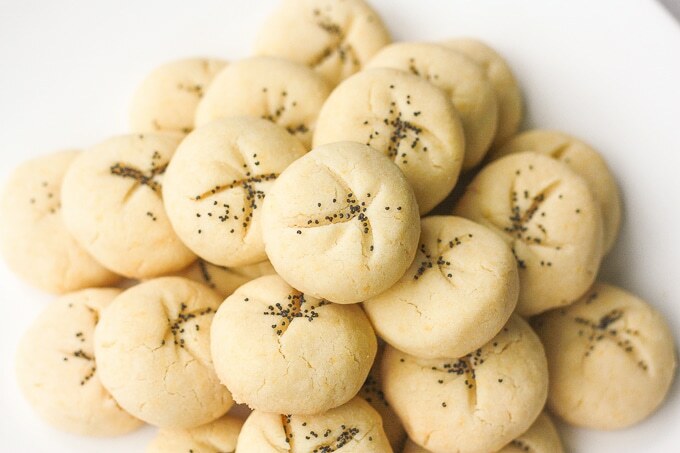 Nan-e Berenji, or Persian rice cookies with poppy seeds, are one of the most traditional cookies in the Persian culture. 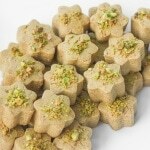 I always looked forward to eating these cookies, along with some of my other favourite baked goodies, every Persian New Year (Norouz). 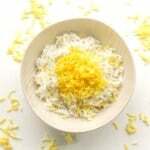 So with Persian New Year approaching next week, I think it’s about time I whip up a batch of these in my own home. But these cookies do not just surface once a year, these cookies are present at every big Persian event… every Norouz party, every engagement party, every wedding (of course, even at my own), and even every funeral. No event is complete without a tray of these classic sweets. It is kind of impossible to just have one. 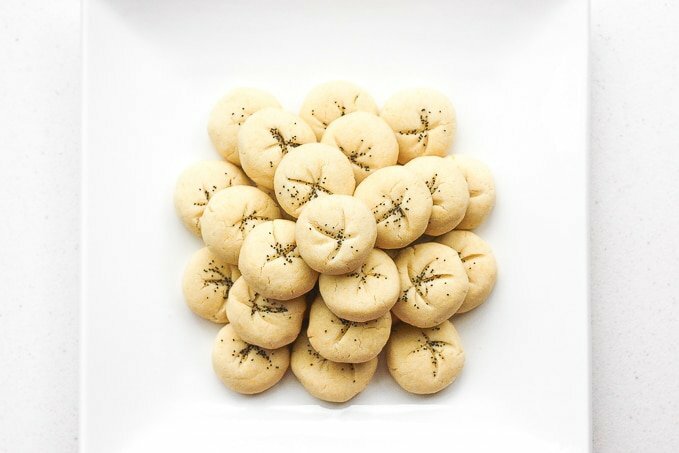 Somehow, when rice flour, fragrant rose water and crunchy poppy seeds comes together, the result is amazing crumbly, melt-in-your-mouth cookies. Yup, I told you. Irresistible. 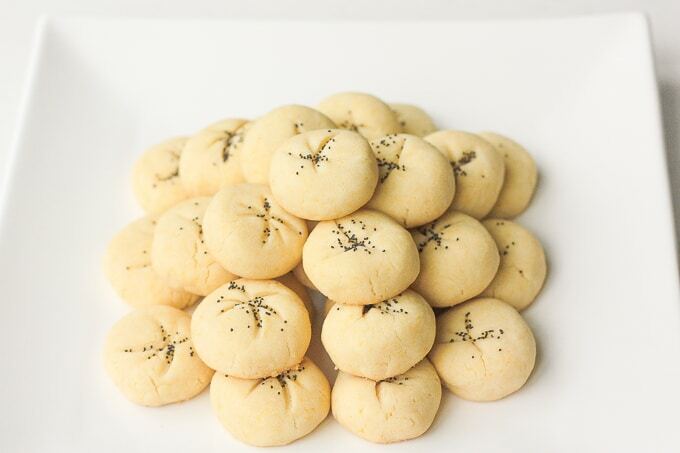 Persian Rice Cookies with Poppy Seeds (Nan-e Berenji) are irresistible, melt-in-your-mouth cookies made of rice flour, fragrant rose water and crunchy poppy seeds. In a large bowl, mix together the oil and sugar with a hand mixer on medium speed for 1-2 minutes. Add egg yolk and mix for another 20-30 seconds. Sift in the rice flour, in three batches. Using a spatula, fold in the flour into mixture after each batch is added. Knead the mixture for 5-10 minutes. Shape into a ball and wrap tightly with plastic wrap and place in the refrigerator overnight. Preheat oven to 325 F and line baking sheet with parchment paper. 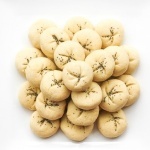 Roll dough into small 1-inch balls and flatten the cookie into a small disc. Repair any cracks on the edges and place on baking sheet. Using the curve of a small teaspoon make overlapping arch-shaped indentation marks on the top. Sprinkle with poppy seeds. Bake for 20-25 minutes until the bottom and edges begins to turn a light golden colour. Let completely cool before carefully removing from baking tray. 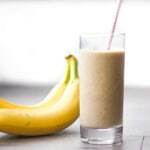 Should I use white or brown rice flour? Thanks! Hi Meredith, you should use white rice flour. 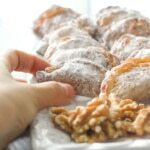 Hi there, I would love to feature your lovely cookies on my German cookie blog by showing one picture and link to your blog and this recipe, if that is ok? Unfortunately, I have never made this recipe without eggs so I would have to do some experimentation to see what would work. My dough turned out really dry and crumbly. I can’t work with it to form a ball. Should I try adding some water or more rosewater? The dough is a crumblier dough. However, kneading helps it shape into a ball. 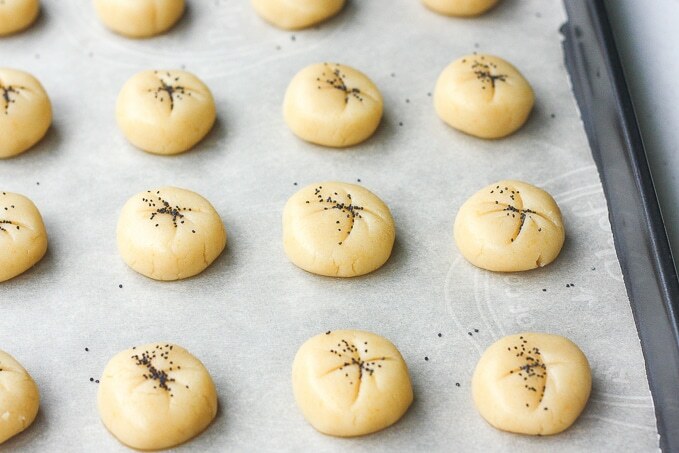 Once you have done that, you should refrigerate the dough overnight and it should be easier to work with. If not, try bringing the dough back to room temperature and adding some oil (very little at a time) and knead it into the dough. Again, note that this is a drier/crumblier cookie. 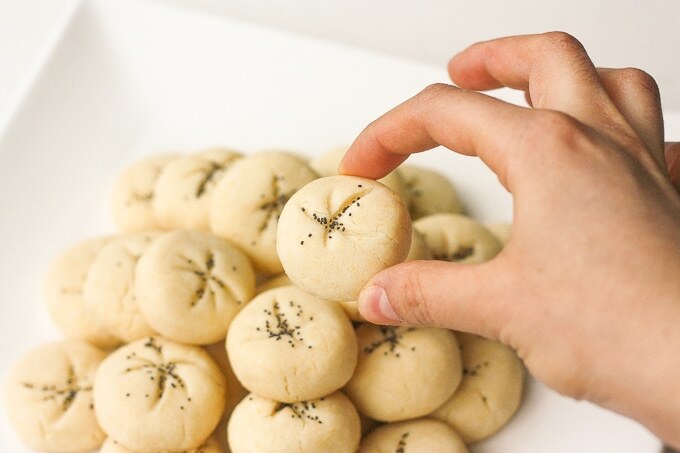 You should be able to make cookies by shaping the dough into little balls and pressing down on them gently to form discs (and fix any cracks on the edges). If you press too hard, they will crumble. These cookies look so pretty and delicate looking. I love trying new recipes from different cultures, so I’m looking forward to making a batch very soon! 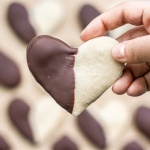 These cookies are very attractive and apart from the norm! Looking forward to giving them a try. These are so gorgeous looking and sounding! I love the combination. Can’t wait to try them :-). Oh I would love to try these! They look so presentable! I’m a sucker for shortbread and I’m a sucker for rosewater, so these are definitely a must-try for me. Can’t wait to bite into one! Those sound wonderful! What a beautiful cookie! Oh me, oh my! These look and sound amazing. I think the rose water is a great secret ingredient that takes these to the next level!